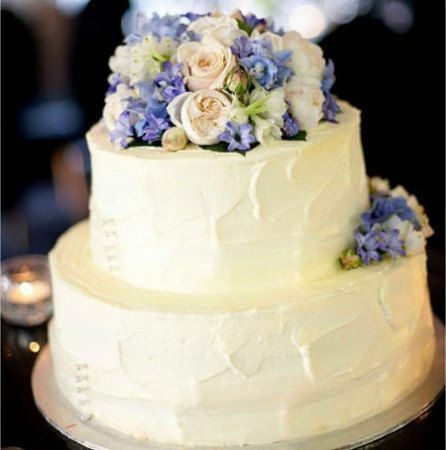 This gorgeous round two-tier wedding cake is covered with delicious soft buttercream frosting and decorated by our professional florist team with an artistic flourish of seasonal flowers in ivory and pale blue. Beautiful! Order online or by contacting us at enquiries@bridesinbloom.com.au. Alternatively click on this enquiry link for a fully customised wedding cake quote within 48 hours. Provides 100 coffee sized servings for wedding guests. Minimum order cut-off seven days prior to wedding day.